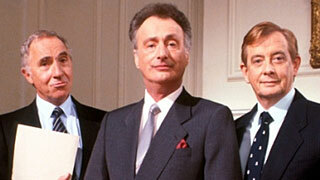 On Friday, October 19th, Jim Hacker reaches the pinnacle of his career when we start airing Yes, Prime Minister. Hacker’s ascension up what he calls the "greasy pole", was announced at the very end of a Christmas Special which originally aired in the UK in December of 1984 - over a year before the new series kicked off. Yes, Prime Minister’s first episode proved very timely. It was first broadcast in the UK on January 9th, 1986. The exact same day that real-life Prime Minister Thatcher’s defense secretary, Michael Heseltine, initiated a political crisis when he sensationally resigned his post by picking up his papers and walking out of a meeting at Number 10. In reflecting on the occasion, Heseltine’s private secretary at the time, Richard Mottram, recalled talking with Heseltine “I said to him 'have you told anyone?' because, being a good civil servant, I thought if he hasn't told anyone, we can always sort of 'un-resign' him. And he said 'Yes, I told the cameraman on the door', and then I realized we were doomed." Sounds like Mr. Mottram would have fit very nicely into Bernard Woolley’s shoes! Both Yes, Minister and Yes, Prime Minister were written by Sir Antony Jay and Jonathan Lynn. As a former speech writer for a number of leading politicians, Jay was able to conduct some fairly accurate research. Once completed, the scripts would be looked over for accuracy by Lord Donoughue, a former Head of the Downing Street Policy Unit. Donoughue also submitted ideas for the two series. Adding to the authenticity of the series was the televised setting. 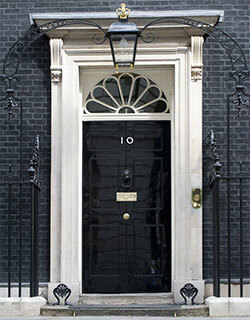 The exterior shots, including the famous black door of Number 10 (through which Eddington, as Hacker, was allowed to walk), were filmed in the normally closed off Downing Street. Although filming wasn’t allowed in the Cabinet Room, the BBC’s production designer was given a private tour with the end result being an almost exact replica. 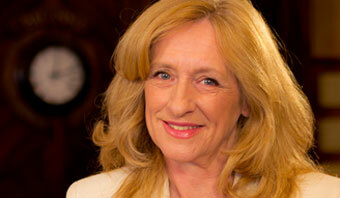 Former Prime Minister David Cameron can personally vouch for the authenticity of the series. While still Prime Minister, he once recalled in an interview with the BBC, that while studying government at university he had to write an essay on “How true to life is Yes, Minister”. As Cameron said in the interview, "I think I wrote...that it wasn't true to life.” I can tell you, as Prime Minister, it is true to life." You can see Yes, Minister and, starting October 19th, Yes, Prime Minister, at 2pm weekday afternoons on Afternoon Tea.